Zucchini is a variety of summer squash. It is a long, cylindrical vegetable, slightly smaller at the stem end, usually dark green in color. The flesh is a pale greenish-white and has a delicate, almost sweet flavor. The glycemic index of zucchini is 15 which falls under low GI category and the glycemic load of 1 cup of chopped raw zucchini is 1. Is Zucchini safe for Diabetics? It is recommendable for diabetics to include 45 to 60 grams of carbohydrates to limit fluctuations in blood sugar levels. This is because carbohydrates impact the blood sugar levels the most. Since 1 cup of chopped raw zucchini provides around 3.9 grams of carbohydrates and the glycemic load is only 1, it fits perfectly into the diabetic meal plan. Due to its low sodium and high potassium content, it is also known to maintain blood pressure. 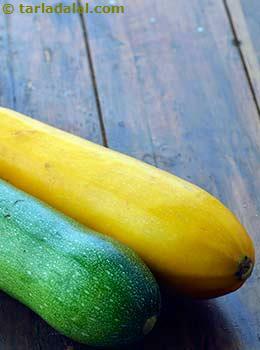 Try including zucchini in your salads in its raw form to minimize the nutrient loss. Is Zucchini suitable for Weight Loss? 1 cup of chopped raw zucchini (approx. 120 grams) provides only around 19 calories. This makes zucchini an ideal vegetable to include in the calorie restricted diet. It provides some amount of fiber (around 1.3g in 1 cup of chopped raw zucchini) which will make you feel full for a longer period of time. Thus appetite is under control and you will experience reduced calorie consumption.Try this healthy Barley Khichdi which has 1/2 cup Zucchini.